Ever wonder what it would be like looking up from an open grave? Well this decoration puts things in perspective. Give your ceiling a view from the grave with Open Grave Insta-View. Open Grave Insta-View will surely have your guests staring up all night long as the grim reaper watches over them. 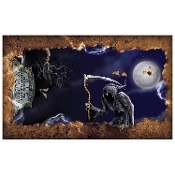 This creative ceiling decoration will keep your guests on edge, knowing that the grim reaper is hovering over them. Reusable plastic sheet fits over your ceiling and will need to be kept in place with your own tape or similar temporary adhesive, NOT included. Insta-View Open Grave image is printed on a clear plastic sheet that measures 3-ft 2-inch High x 5-ft 2-inch Wide (95cm x 155cm).